Ada's brilliant collection of eternity and half eternity bands feature superlative manmade diamonds for a brighter future. Ada Diamonds offers the world’s most brilliant, conflict free diamond jewelry. All of Ada's bridal pieces are fully bespoke and made-to order. No mass-produced settings, no compromises. Our stunning collection of wedding bands feature conflict free diamonds and responsibly sourced metals. All of our rings are cast and hand-set right here in the United States. 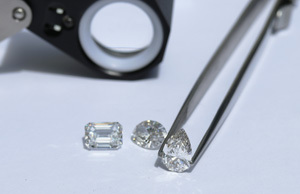 What are laboratory grown diamonds? How are they priced? How are they different from natural, mined diamonds? Are they the same thing as diamond simulants? Learn the answers to these questions and more at the links below.